A Weekend Brunch Cruise aboard Mariposa’s Northern Spirit. #ad @mariposacruises - Big Daddy Kreativ - Lifestyle blogger in Toronto, Oakville A Weekend Brunch Cruise aboard Mariposa’s Northern Spirit. Disclosure: Our brunch cruise experience was covered by Mariposa Cruises. All opinions are my own. Now in its 31st year, Mariposa Cruises has been hosting unforgettable experiences on the waters of lake Ontario, and has welcomed more than three million guests aboard its decks. WIth its home base at Queen’s Quay on Toronto’s iconic waterfront, Mariposa Cruises is known for having the best cuisine in the harbourfront. Weekend brunch cruises, weekday sip & sails (think “happy hour on the lake”), scenic sunset dinner cruises, and Toronto harbour tours are just a few of the options available. Mariposa Cruises’ fleet includes six amazing vessels, including two of the largest ships in Toronto’s harbourfront… the Captain Matthew Flinders, and the Northern Spirit. The latter of the two, which we had the pleasure of experiencing the brunch cruise on, just unveiled a $500,000 interior renovation. With Mariposa Cruises – it truly is a one-stop event shop with complete on-board planning, catering and gorgeous décor options for weddings, social events, client appreciation and team-building events. All you have to do is invite people, show up, relax, and have fun! Mariposa Cruises takes care of the rest. 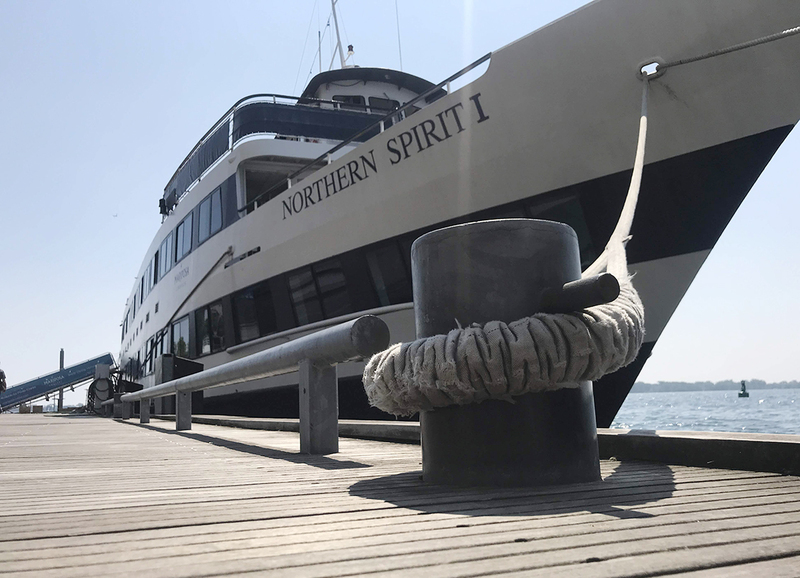 At 140 feet, the newly renovated Northern Spirit is one of the largest passenger vessels in Toronto. It has a 500+ person capacity, with a beautiful dining area, new sound system, and refreshed decor. There is a good-sized dance floor, so if you are thinking of hosting an event aboard the Northern Spirit, there is no shortage of room to bust a move! And the got buffet, which featured roasted potatoes, French toast, beef sausages, pork sausages, maple bacon, and scrambled eggs. Brunch was fantastic! There was something in the section that we all enjoyed. The girls even went back for seconds! I may have grabbed a second helping of fresh pineapple. Once we were finished eating, a server brought out fresh baked cannolis… Sicilian tube-shaped pastry, filled with a sweet ricotta filling, lightly sprinkled with powdered sugar. So good! Rachel and Lauren had an amazing time on their first cruise of Lake Ontario. It really is a fantastic way to to spend the afternoon in Toronto. The views of “The 6” were fantastic! You can follow Mariposa Cruises on Instagram, Facebook, and Twitter.